The technical setups in these five REITs are showing solid trading potential right now. Editor's pick: Originally published Jan. 12. While most investors have been transfixed on backsliding stock prices over the last couple of weeks, real estate investment trusts (better known as REITs) have quietly been outperforming. That might come as a surprise to many, particularly with December's rate hike from the Fed. Typically, higher interest rates put downward pressure on big dividend-payers such as REITs, but this unique subset of stocks is actually beating just about every other asset class on the market right now. From a relative strength standpoint, REITs have pulled ahead of the broader U.S. stock market in recent weeks. They're beating overseas equities and fixed income. They're crushing commodities such as gold and energy. And that trend is starting to accelerate in 2016. That doesn't mean it's a good idea to start indiscriminately buying up REITs, however. Some are set to perform a lot better than others. To make heads or tails of the REITs that look best-positioned for breakout gains, we're turning the charts for a technical look at four potential buy signals -- and one to sell. Without further ado, here's a rundown of five technical setups that are showing solid trading potential right now. We're starting small this week, with small-cap shopping center REIT Ramco-Gershenson Properties Trust (RPT - Get Report) . Shares of Ramco-Gershenson Properties bottomed back in September, and this stock has been ratcheting its way higher ever since. Including this stock's hefty dividend payout, investors are sitting on total returns of 15.2% in the last three months and change, beating the S&P 500 by a wide margin. But don't worry if you've missed the move in Ramco-Gershenson Properties so far. Shares look ready to kick off a second leg higher here. Since November, Ramco-Gershenson Properties has been forming an ascending triangle pattern, a bullish continuation setup that's formed by horizontal resistance up above shares (at $17 in this case) and uptrending support to the downside. Basically, as this stock bounces in between those two technically significant price levels, shares have been getting squeezed closer and closer to a breakout above our $17 price ceiling. When that breakout happens, we've got our buy signal. 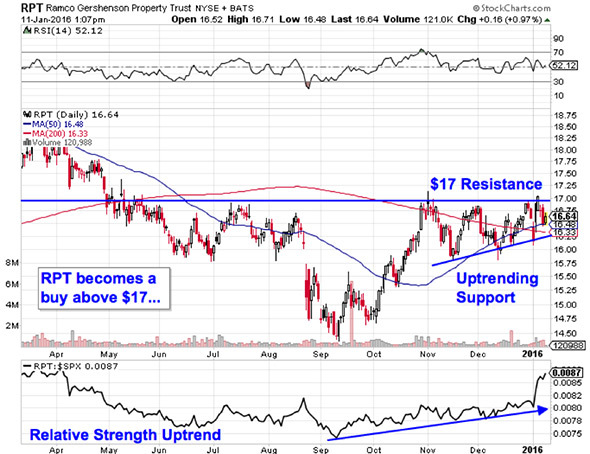 RPT's relative strength line provides an important side indicator to watch here. Relative strength, at the bottom of the chart, has been holding onto its uptrend since shares reversed higher in September, indicating that Ramco-Gershenson Properties is still outperforming the broad market this winter. 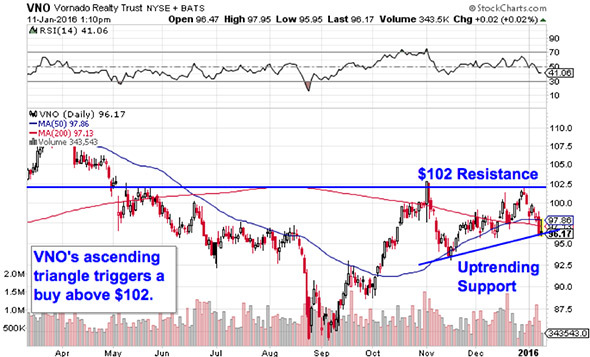 If shares can hold out above $17, RPT becomes a buy. We're seeing an almost identical chart setup in shares of a much bigger REIT -- $18 billion commercial landlord Vornado Realty Trust (VNO - Get Report) . Like RPT, Vornado is currently forming an ascending triangle setup. The key level to watch for Vornado is resistance up at $102. Why all of that significance at the $102 level? It all comes down to buyers and sellers. Price patterns, such as this ascending triangle setup in Vornado Realty Trust, are a good quick way to identify what's going on in the price action, but they're not the actual reason a stock is tradable. Instead, the "why" comes down to basic supply and demand for Vornado's shares. The $102 resistance level is a price where there has been an excess of supply of shares; in other words, it's a spot where sellers have previously been more eager to step in and take gains than buyers have been to buy. That's what makes a breakout above $102 so significant -- the move means that buyers are finally strong enough to absorb all of the excess supply above that price level. Remember to be reactionary here. Upside in Vornado doesn't become a high-probability trade until shares are able to catch a bid materially above $102. It's been a rough year for shareholders in Ladder Capital (LADR - Get Report) . In the last 12 months, even factoring a hefty dividend payout, this mortgage REIT stock has seen its share price slide 26.6%. That's some pretty ugly underperformance – the good news, though, is that shares are starting to look "bottomy" this winter. 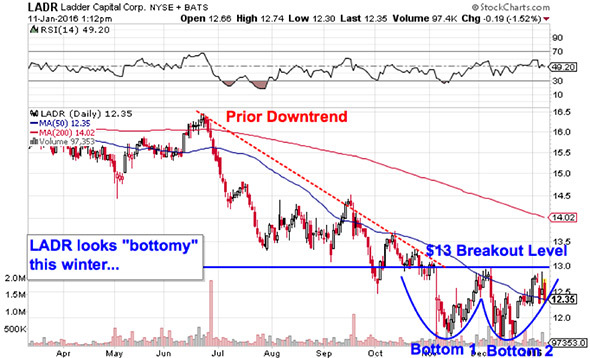 Ladder Capital is currently forming a double bottom pattern, a bullish reversal setup that looks just like it sounds. The double bottom pattern in Ladder Capital is formed by a pair of swing lows that bottom out at approximately the same price level. The breakout buy signal comes when Ladder is able to catch a bid above the peak that separates that pair of price troughs. For Ladder Capital, that level to watch is resistance up at $13. It's a good idea to look at any attempt through $13 with a little skepticism at first. After all, Ladder Capital has been stuck in a pretty well-defined downtrend since the start of the summer, and shares have continued to make a series of lower highs through today. To avoid a whipsaw, it makes sense to wait for a meaningful move through $13 before trying to catch the reversal in this stock. In the meantime, healthcare real estate company Physicians Realty Trust (DOC - Get Report) has been showing off some serious strength lately. Since September, this medical office and hospital landlord has handed investors total returns totaling 20% -- and this REIT continues to be a "buy-the-dips stock" in 2016. The good news is that you don't need to be an expert trader to figure out what's going on in this stock; the price setup is about as simple as they get. Physicians Realty Trust has been making its way higher in a well-defined uptrending channel since September, bouncing its way higher ever time the bottom of that trading range has been tested. The uptrend in Physicians Realty Trust is formed by a pair of parallel trend lines that have identified the high probability range for shares to stay stuck within. 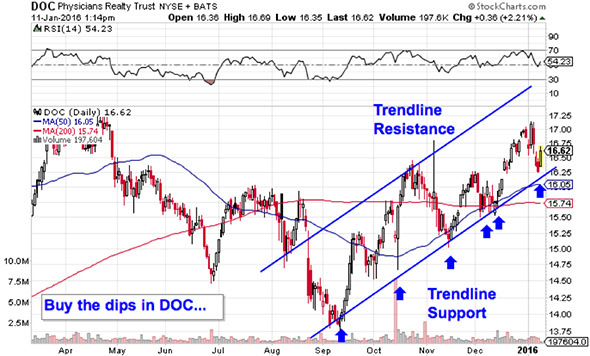 Every test of trend line support has provided a low-risk, high-reward buying opportunity. And shares are bouncing off of support for a sixth time this week. Actually waiting for this week's bounce is important for two key reasons: It's the spot where shares have the most room to move up before they hit resistance, and it's the spot where the risk is the least (because shares have the least room to move lower before the channel breaks, and you know you're wrong). Remember, all trend lines do eventually break, but by actually waiting for a bounce to happen first, you're ensuring Physicians Realty Trust can actually still muster buying pressure along that line before you put your money on shares. From here, the 50-day moving average is a logical place to park a protective stop. Not all the trades we're looking at today are upside setups. Last up on our list of REIT trades is Empire State Realty Trust (ESRT - Get Report) . Empire State is the exception that proves stock picking still matters for REIT investors this winter. While the whole industry is showing strength right now, this $2 billion trust is showing some worrying cracks in 2016. Here's why. Empire State is currently forming a head and shoulders pattern, a bearish reversal setup that indicates exhaustion among buyers. The head and shoulders pattern is formed by two swing highs that top out at approximately the same level (the shoulders), separated by a higher high (the head). The sell signal comes on a move through Empire State's neckline -- that's currently at the $17.40 price level. 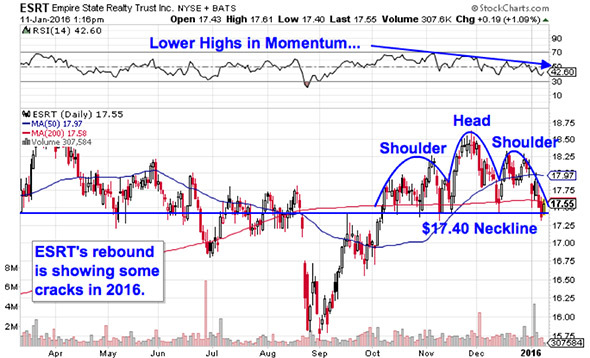 Price momentum is an extra red flag to watch in Empire State Realty Trust right now. Our momentum gauge, 14-day RSI, has been in a downtrend since this pattern started forming. That's a bearish divergence from price that signals buyers have been quietly fading in shares of Empire State since the fall. If $17.40 gets violated, then it's time to sell this stock.